Oncofetal genes are genes that express abundantly in both fetal and tumor tissues yet downregulated or undetected in adult tissues, and can be used as tumor markers for cancer diagnosis and treatment. Meanwhile, long noncoding RNAs (lncRNAs) are known to play crucial roles in the pathogenesis of hepatocellular carcinoma (HCC), including tumor growth, proliferation, metastasis, invasion, and recurrence. We performed a genome-wide screening using microarrays to detect the lncRNA expression profiles in fetal livers, adult livers, and liver cancer tissues from mice to identify oncofetal lncRNAs in HCC. From the microarray data analysis, we identified lncRNA Ptn-dt as a possible oncofetal gene. Both in vitro and in vivo experiments results confirmed that overexpression of Ptn-dt significantly promoted the proliferation of mouse HCC cells. RNA pulldown assay showed that Ptn-dt could interact with the HuR protein. Interestingly, miR-96 binds with HuR to maintain its stability as well. Overexpression of lncRNA Ptn-dt led to the downregulation of miR-96, which might be due to the interaction between Ptn-dt and HuR. Meanwhile, previous studies have reported that Ptn can promote tumor growth and vascular abnormalization via anaplastic lymphoma kinase (Alk) signaling. In our study, we found that overexpression of Ptn-dt could promote the expression of Alk through repressing miR-96 via interacting with HuR, thus enhancing the biologic function of Ptn. In summary, a new oncofetal lncRNA Ptn-dt is identified, and it can promote the proliferation of HCC cells by regulating the HuR/miR-96/Alk pathway and Ptn-Alk axis. Venook AP, Papandreou C, Furuse J, de Guevara LL. The incidence and epidemiology of hepatocellular carcinoma: a global and regional perspective. Oncologist. 2010;15(Suppl 4):5–13. Iavarone M, Cabibbo G, Biolato M, Della Corte C, Maida M, Barbara M, et al. Predictors of survival in patients with advanced hepatocellular carcinoma who permanently discontinued sorafenib. Hepatology. 2015;62:784–91. Coulouarn C, Derambure C, Lefebvre G, Daveau R, Hiron M, Scotte M, et al. Global gene repression in hepatocellular carcinoma and fetal liver, and suppression of dudulin-2 mRNA as a possible marker for the cirrhosis-to-tumor transition. J Hepatol. 2005;42:860–9. Liu H, Kho AT, Kohane IS, Sun Y. Predicting survival within the lung cancer histopathological hierarchy using a multi-scale genomic model of development. PLoS Med. 2006;3:e232. Hu M, Shivdasani RA. Overlapping gene expression in fetal mouse intestine development and human colorectal cancer. Cancer Res. 2005;65:8715–22. Yamauchi N, Watanabe A, Hishinuma M, Ohashi K, Midorikawa Y, Morishita Y, et al. The glypican 3 oncofetal protein is a promising diagnostic marker for hepatocellular carcinoma. Mod Pathol. 2005;18:1591–8. Zhang Y, Yang J, Li H, Wu Y, Zhang H, Chen W. Tumor markers CA19-9, CA242 and CEA in the diagnosis of pancreatic cancer: a meta-analysis. Int J Clin Exp Med. 2015;8:11683–91. Becker D, Sfakianakis I, Krupp M, Staib F, Gerhold-Ay A, Victor A, et al. Genetic signatures shared in embryonic liver development and liver cancer define prognostically relevant subgroups in HCC. Mol Cancer. 2012;11:55. Bergstrand CG, Czar B. Demonstration of a new protein fraction in serum from the human fetus. Scand J Clin Lab Invest. 1956;8:174. Yong KJ, Gao C, Lim JS, Yan B, Yang H, Dimitrov T, et al. Oncofetal gene SALL4 in aggressive hepatocellular carcinoma. N Eng J Med. 2013;368:2266–76. Quinn JJ, Chang HY. Unique features of long non-coding RNA biogenesis and function. Nat Rev Genet. 2016;17:47–62. Raveh E, Matouk IJ, Gilon M, Hochberg A. The H19 long non-coding RNA in cancer initiation, progression and metastasis—a proposed unifying theory. Mol Cancer. 2015;14:184. Gupta RA, Shah N, Wang KC, Kim J, Horlings HM, Wong DJ, et al. Long non-coding RNA HOTAIR reprograms chromatin state to promote cancer metastasis. Nature. 2010;464:1071–6. Boyerinas B, Park SM, Shomron N, Hedegaard MM, Vinther J, Andersen JS, et al. Identification of let-7-regulated oncofetal genes. Cancer Res. 2008;68:2587–91. Wang F, Yuan JH, Wang SB, Yang F, Yuan SX, Ye C, et al. Oncofetal long noncoding RNA PVT1 promotes proliferation and stem cell-like property of hepatocellular carcinoma cells by stabilizing NOP2. Hepatology. 2014;60:1278–90. Zheng L, Gong W, Liang P, Huang X, You N, Han KQ, et al. Effects of AFP-activated PI3K/Akt signaling pathway on cell proliferation of liver cancer. Tumor Biol. 2014;35:4095–9. Srikantan S, Tominaga K, Gorospe M. Functional interplay between RNA-binding protein HuR and microRNAs. Curr Protein Pept Sci. 2012;13:372–9. Cao C, Sun J, Zhang D, Guo X, Xie L, Li X, et al. The long intergenic noncoding RNA UFC1, a target of MicroRNA 34a, interacts with the mRNA stabilizing protein HuR to increase levels of beta-catenin in HCC cells. Gastroenterology. 2015;148:415–26 e18. Hashiguchi Y, Nishida N, Mimori K, Sudo T, Tanaka F, Shibata K, et al. Down-regulation of miR-125a-3p in human gastric cancer and its clinicopathological significance. Int J Oncol. 2012;40:1477–82. Filipowicz W, Grosshans H. The liver-specific microRNA miR-122: biology and therapeutic potential. Progress Drug Res Fortschr der Arzneim Progres Des Rech Pharm. 2011;67:221–38. Xu F, Zhang X, Lei Y, Liu X, Liu Z, Tong T, et al. Loss of repression of HuR translation by miR-16 may be responsible for the elevation of HuR in human breast carcinoma. J Cell Biochem. 2010;111:727–34. Vishwamitra D, Li Y, Wilson D, Manshouri R, Curry CV, Shi B, et al. MicroRNA 96 is a post-transcriptional suppressor of anaplastic lymphoma kinase expression. Am J Pathol. 2012;180:1772–80. Papadimitriou E, Mikelis C, Lampropoulou E, Koutsioumpa M, Theochari K, Tsirmoula S, et al. Roles of pleiotrophin in tumor growth and angiogenesis. Eur Cytokine Netw. 2009;20:180–90. Powers C, Aigner A, Stoica GE, Mcdonnell K, Wellstein A. Pleiotrophin signaling through anaplastic lymphoma kinase is rate-limiting for glioblastoma growth. J Biol Chem. 2002;277:14153–8. Rosenfield SM, Bowden ET, Cohen-Missner S, Gibby KA, Ory V, Henke RT, et al. Pleiotrophin (PTN) expression and function and in the mouse mammary gland and mammary epithelial cells. PLoS ONE. 2012;7:e47876. Perezpinera P, Berenson JR, Deuel TF. Pleiotrophin, a multifunctional angiogenic factor: mechanisms and pathways in normal and pathological angiogenesis. Curr Opin Hematol. 2008;15:210–4. Zhang L, Dimberg A. Pleiotrophin is a driver of vascular abnormalization in glioblastoma. Mol Cell Oncol. 2016;3:e1141087. Jemal A, Bray F, Center MM, Ferlay J, Ward E, Forman D. Global cancer statistics. CA Cancer J Clin. 2011;61:69–90. Ma Y, Zhang P, Wang F, Yang J, Yang Z, Qin H. The relationship between early embryo development and tumourigenesis. J Cell Mol Med. 2010;14:2697–701. Kotake Y, Nakagawa T, Kitagawa K, Suzuki S, Liu N, Kitagawa M, et al. Long non-coding RNA ANRIL is required for the PRC2 recruitment to and silencing ofp15(INK4B) tumor suppressor gene. Oncogene. 2011;30:1956–62. Majumdar A, Curley SA, Wu X, Brown P, Hwang JP, Shetty K, et al. Hepatic stem cells and transforming growth factor beta in hepatocellular carcinoma. Nat Rev Gastroenterol Hepatol. 2012;9:530–8. Wang S, Wu X, Liu Y, Yuan J, Yang F, Huang J, et al. Long noncoding RNA H19 inhibits the proliferation of fetal liver cells and the Wnt signaling pathway. FEBS Lett. 2016;590:559–70. Xu D, Yang F, Yuan JH, Zhang L, Bi HS, Zhou CC, et al. Long noncoding RNAs associated with liver regeneration 1 accelerates hepatocyte proliferation during liver regeneration by activating Wnt/β‐Catenin signaling. Hepatology. 2013;58:739. Michelotti GA, Tucker A, Swiderska-Syn M, Machado MV, Choi SS, Kruger L, et al. Pleiotrophin regulates the ductular reaction by controlling the migration of cells in liver progenitor niches. Gut. 2016;65:683–92. Park TJ, Jeong BR, Tateno C, Kim HS, Ogawa T, Lim IK, et al. 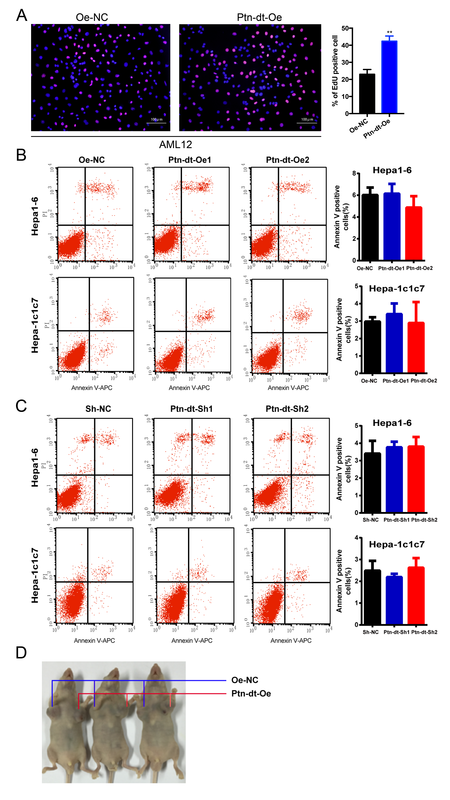 Pleiotrophin inhibits transforming growth factor beta1-induced apoptosis in hepatoma cell lines. Mol Carcinog. 2008;47:784–96. Grzelinski M, Steinberg F, Martens T, Czubayko F, Lamszus K, Aigner A. Enhanced antitumorigenic effects in glioblastoma on double targeting of pleiotrophin and its receptor ALK. Neoplasia. 2009;11:145–56. Koutsioumpa M, Poimenidi E, Pantazaka E, Theodoropoulou C, Skoura A, Megalooikonomou V, et al. Receptor protein tyrosine phosphatase beta/zeta is a functional binding partner for vascular endothelial growth factor. Mol Cancer. 2015;14:19. Prensner JR, Iyer MK, Balbin OA, Dhanasekaran SM, Cao Q, Brenner JC, et al. Transcriptome sequencing across a prostate cancer cohort identifies PCAT-1, an unannotated lincRNA implicated in disease progression. Nat Biotechnol. 2011;29:742–9. Martens-Uzunova ES, Bottcher R, Croce CM, Jenster G, Visakorpi T, Calin GA. Long noncoding RNA in prostate, bladder, and kidney cancer. Eur Urol. 2014;65:1140–51. Cooper C, Guo J, Yan Y, Chooniedass-Kothari S, Hube F, Hamedani MK, et al. Increasing the relative expression of endogenous non-coding Steroid Receptor RNA Activator (SRA) in human breast cancer cells using modified oligonucleotides. Nucleic Acids Res. 2009;37:4518–31. Wilusz CJ, Wilusz J. HuR and translation—the missing linc(RNA). Mol Cell. 2012;47:495–6. Huang JF, Guo YJ, Zhao CX, Yuan SX, Wang Y, Tang GN, et al. Hepatitis B virus X protein (HBx)-related long noncoding RNA (lncRNA) down-regulated expression by HBx (Dreh) inhibits hepatocellular carcinoma metastasis by targeting the intermediate filament protein vimentin. Hepatology. 2013;57:1882–92. Ulitsky I, Bartel DP. lincRNAs: genomics, evolution, and mechanisms. Cell . 2013;154:26–46. Brennan CM, Steitz JA. HuR and mRNA stability. Cell Mol Life Sci: Cmls. 2001;58:266–77. Yuan JH, Yang F, Wang F, Ma JZ, Guo YJ, Tao QF, et al. A long noncoding RNA activated by TGF-beta promotes the invasion-metastasis cascade in hepatocellular carcinoma. Cancer Cell. 2014;25:666–81. Wang L, Park HJ, Dasari S, Wang S, Kocher J-P, Li W. CPAT: Coding-Potential Assessment Tool using an alignment-free logistic regression model. Nucleic Acids Res. 2013;41:e74–e. Kong L, Zhang Y, Ye Z-Q, Liu X-Q, Zhao S-Q, Wei L, et al. CPC: assess the protein-coding potential of transcripts using sequence features and support vector machine. Nucleic Acids Res. 2007;35(Web Server issue):W345–W9. We thank Dr. Li Su for the help in flow cytometry technique, and the Institutional Animal Care and Use Committee (the Second Military Medical University, Shanghai, China) for the ethics approval of animal studies. Some elements of Fig. 6 are from LES LABORATOIRES SERVIER. This work was supported by grants from the National Key Basic Research Program (973 project) (2015CB554004) from the Ministry of Science and Technology of China, the National Natural Science Foundation of China (81672775 and 81330037) and the Natural Science Foundation of Shanghai (15XD1504500). Correspondence to Li-Ye Ma or Hui-Rong Yin or Fang Wang.